Thank you for your question and photo. Leave the rose bush alone for this year. 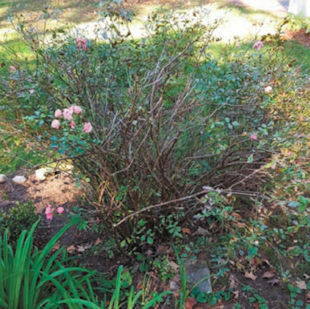 Next spring (around mid-April), remove (cut off) all of the dead stems down to the base of the plant. Then cut the shrub back by 1/3. Do not use hedge shears. Cut each stem with hand pruners. Make sure there is open space in the middle of the shrub for good air flow. Thin some of the stems in the center of the shrub, if needed. Add some compost around the base of the shrub and work into soil. Compost will help hold water in the soil and add healthy microbes to the soil that will help fertilize the shrub. If you donâ€™t have compost, fertilize with Rosetone Rose fertilizer by Epsoma. It is a dry, organic, slow release fertilizer, especially made for roses that will supply nutrients to help the shrub to flower. Take a couple of handfuls of fertilizer and spread around the base of the shrub, (not near the stem) and work into the soil. Water deeply. Add 1-3 inches of mulch to keep the soil cool, moist and weed free. Water well during the summer (approximately one - 5 gallon bucket of water per week), especially if there is no rainfall. After the first bloom in June, cut off the spent roses. Cutting off the spent roses deters the plant from forming rose hips (fruit) and helps the plant to form more flowers for a second blooming. The second flowering will occur at the end of August into September. After this bloom time, do not cut the spent flowers. Let the hips form and leave them on the plant. Rose hips are a great source of high energy food for birds during the winter months. You will need to fertilize your rose once a month with Rosetone until the end of August. Roses, in general, require lots of fertilizer to produce flowers throughout the entire growing season. Do not fertilize after the beginning of September because that will promote new growth that could be killed back by frost in October. Thank you for a great question and best of luck!